The Federal Solar Tax credit, also known as the Investment Tax Credit (ITC) makes solar more affordable for homeowners and businesses by granting a dollar for dollar tax deduction that is 30% of the total cost of an energy system utilizing solar panels! The average national gross cost of installing a solar panel system is around $30,000. You can pocket a 10K Tax Credit, that if not used can carry over the future years until all of the credit has been used up. HOW TO BE ELIGIBLE FOR A CREDIT? OWN YOUR SYSTEM – This cannot be a lease from someone else or a 3rd party. Some special cases involving a lease SRECs – solar energy renewable certificates. These apply to solar system that is NOT on your primary home, as long as you own the property and live in it for at least part of the year, you can claim the solar tax credit. If you pay $30,000 to install a solar system on your home in 2015 you’re eligible for a $10,000 federal solar tax credit. If your tax liability for 2016 was only $4000, you’ll owe no federal taxes that year and in 2017, you will reduce your tax liability by $6000. Contact John and he can give you an estimate of what solar can save you, and if you have questions about the Nickel-Iron (Ni-Fe) Batteries that last 30 years and beyond, we can help you size and build a system that will accommodate your needs and much more. How do i claim the Federal Solar Tax Credit for 2016? Form 5695 calculates tax credits for a variety of qualified residential energy improvements, including geothermal heat pumps, solar panels, solar water heating, small wind turbines, and fuel cells. We’ll use the national average gross cost of a solar energy system as an example. First, you will need to know the qualified solar electric property costs. That is the total gross cost of your solar energy system after any cash rebates. Add that to line 1. Insert the total cost of any additional energy improvements, if any, on lines 2 through 4, and add them up on line 5. On line 6, multiply line 5 by 30%. This is the amount of the solar tax credit. Assuming you are not also receiving a tax credit for fuel cells installed on your property, and you aren’t carrying forward any credits from last year, put the value from line 6 on line 13. Now you need to calculate if you will have enough tax liability to get the full 30% credit in one year. Enter the result on line 14 of Form 5695. Review line 13 and line 14, and put the smaller of the two values on line 15. If your tax liability is smaller than your tax credits, subtract line 15 from line 13, and enter it on line 16. That’s the amount you can claim on next year’s taxes. The value on line 15 is the amount that will be credited on your taxes this year. 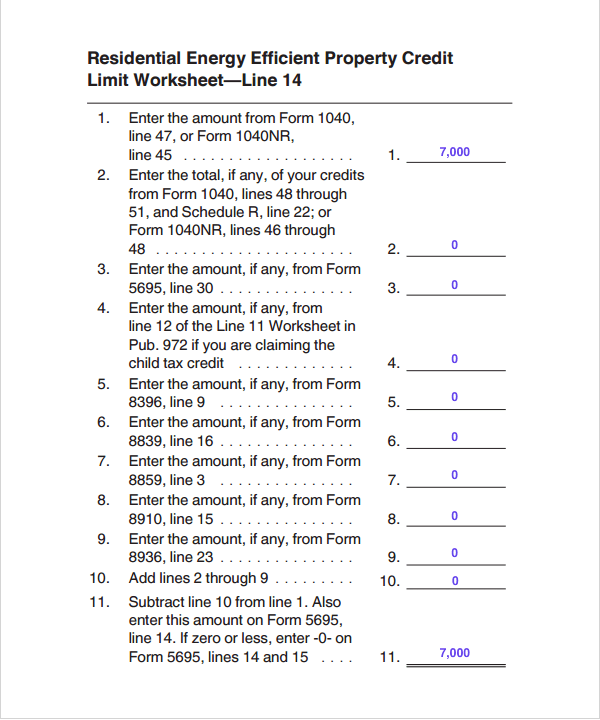 Enter that value into Form 1040, line 53 (or Form 1040NR, line 50). The steps above outline all you need to do to have 30% of the cost of your solar panel system credited back to you!. If you need instructions filling out form 5695 click here. NextThe Completed Off Grid Solar Panel 12v Water Pumping solution has overfilled the top 1000 Gallon Concrete water Cistern! !